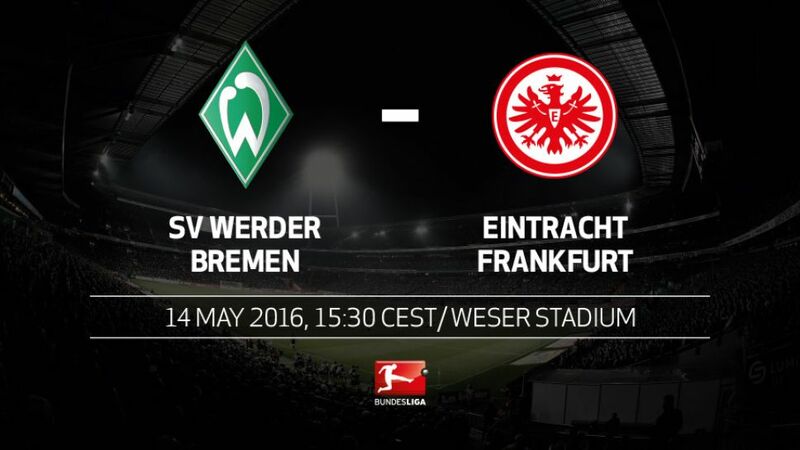 The battle to avoid relegation to Bundesliga 2 hinges on this one fixture at the Weser Stadium between SV Werder Bremen and Eintracht Frankfurt (kick-off 15:30CEST/13:30GMT). Hosts Bremen need a win to climb above their guests and out of the bottom three, thus securing another season in the top flight of German football. Draw or lose, however, and then things start to get complicated for Viktor Skripnik's men. The equation is even easier for Frankfurt, who know that a draw or a win will see them end the season above the drop zone, whereas defeat means a relegation play-off for Niko Kovac's men, or even worse in the event of an extraordinary turn of events which would see VfB Stuttgart overturn a six-goal inferior goal difference on their trip to VfL Wolfsburg. One thing is certain: three into two does not go, meaning there will be both tears of joy and sorrow at the final whistle this Saturday. Eintracht Frankfurt recorded a first win in seven games by beating fellow strugglers SV Werder Bremen 2-1 at the Commerzbank Arena on Matchday 17. In their 52nd Bundesliga season, Bremen's top-flight survival hinges on the final day for the first time in their history.Frankfurt are the only team to have won their last three games. Werder have won their last two home games. Bremen have not managed three consecutive home wins since the winter of the 2014/15 season. Eintracht have lost only once in their last five visits to Bremen.Werder's 0-0 draw against Köln last week was their first goalless match this season. Bremen's last clean sheet at home was in May 2015, when they beat Eintracht 1-0.Stefan Aigner has scored the winning goal in the last two games, against SV Darmstadt 98 and Borussia Dortmund. His only previous goal this season was the winner against Bremen in the reverse fixture (2-1).Claudio Pizarro has scored in his last five home games. The only home defeat in the Rückrunde occurred when Pizarro was injured.Three of Frankfurt's last five goals have been scored from set pieces. Bremen have conceded 20 goals from set pieces - more than any other team.Werder have conceded seven home defeats this season.